Agriculture is Alexis Anderson’s pride and joy. Alexis is based in the Lampasas area where she grew up raising sheep and goats, and where she and her fiancé now have a cattle company. She loves sharing what she’s learned by working with 4H and FFA students on their livestock projects. Alexis grew up watching her father grow his own construction company and now is helping her fiancé do the same. When she does have a little time for fun, Alexis enjoys woodworking projects as well as working horses, hunting, fishing and playing with her two dogs. Her favorite restaurant is a tiny place in Burnet, Texas called Las Comadres. 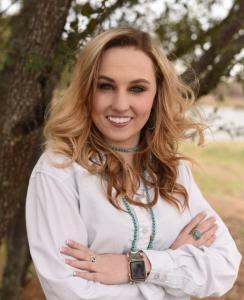 Alexis brings her passion for South Texas agriculture to ranch real estate, and attributes her success to her determination and willingness to do whatever it takes to get the job done. Whether you need her to market your ranch property or help you find the perfect turn-key ranch, unimproved development property, or anything in between, Alexis will get it done for you.